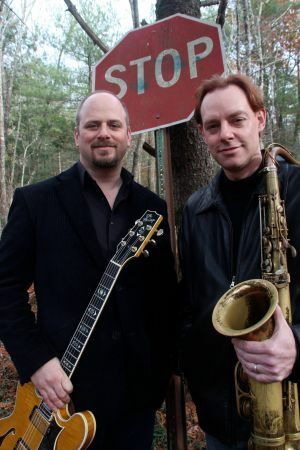 Matthew Finck, guitar, and Jonathan Ball, tenor saxophone, with their new album It’s Not That Far, continue the vast and varied range of collaborations between their instruments. Their collective experience reaches back deep to the blues, gospel, and R&B, is grounded in bebop, and draws from sources as disparate as funk, rock, Bossa Nova and fusion. Matthew Finck (b.1972) has collaborated in the past with Roswell Rudd, John Medeski, and Steve Wilson; among many. Jonathan Ball (b.1968) has teamed up with Ira Coleman, Randy Gillespie, Giovanni Hildago, Charles Flores, and Dafnis Prieto; to name just a few. The rhythm section, anchored by Jay Anderson (b.1955) on bass and Adam Nussbaum (b.1955) on drums, delivers a percussive and unerringly consistent pulse that is highly textured and finely layered.